Shiite powerhouse Iran seems to have drawn the battle lines for Shiite-Sunni warfare in Lebanon, Syria and Iraq -- a total area of 634,000 square kilometers with an overall population of 58 million. Syria’s minority Alawite sect — an offshoot of Shiite Islam — dominates Bashar al-Assad’s regime while the rebels fighting to overthrow the Syrian president are mostly from the Sunni majority. 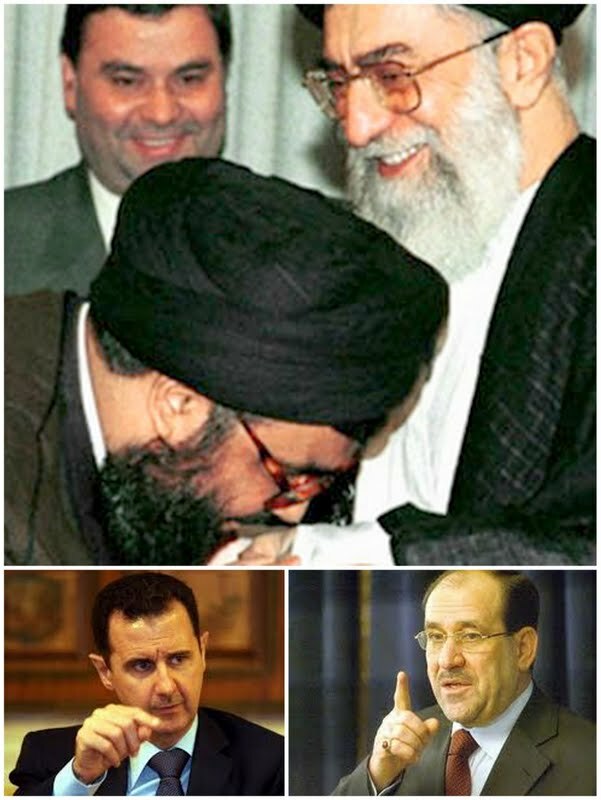 Assad's major allies – Iran, its Lebanese Hezbollah cat’s-paw and Tehran’s Iraqi surrogate Prime Minister Nouri al-Maliki -- are all Shiite. Closely allied with Damascus since the 1980-1988 Iran-Iraq war, Tehran remains Assad's main political and diplomatic backer, arms supplier and financier. Iranian advisers help man Assad’s war room and Iranian Revolutionary Guards are present in Syria in numbers ranging into the hundreds, though exact figures cannot be determined. Last January 48 Iranians held hostage by rebel fighters in Syria were released in exchange for 2,130 prisoners held by the Syrian authorities. The Syrian opposition said the 48 Iranians captured in August 2012 were members of the Revolutionary Guards on their way to join pro-Assad forces. Iran said they were simple pilgrims on their way to the Shiite shrine of Sayyeda Zeinab in southern Damascus. Shiite fighters from Iran, Lebanon and Iraq are now deployed in the Syrian capital’s Sayyeda Zeinab neighborhood. Ten weeks ago Iran’s point man in Lebanon and Syria was ambushed and killed by Syrian opposition forces while travelling overland to Beirut from Damascus. The semiofficial Fars news agency identified the slain Revolutionary Guards commanding officer as Hassan Shateri. In Lebanon, Shateri was posing as “Hessam Khoshnevis,” head of an Iranian agency set up to help rebuild Hezbollah-controlled areas devastated by the 2006 war with Israel (see my February 14 post). More recently, Iran and Hezbollah built a 50,000-strong “People’s Army” of Syrian militiamen to bolster Assad’s depleted regular army. Hezbollah is now playing a more deepening and barefaced role in the Syria war just across the Lebanese border. Assad warplanes this week provided Hezbollah fighters with aerial cover to help them advance near the strategic town of al-Qusayr in Homs province. The border region near Homs on the Syria side is strategic because it links Damascus with the coastal enclave that is the heartland of Syria's Alawites and is also home to the country's two main seaports, Latakia and Tartus. The battle for al-Qusayr has inflamed tensions in Lebanon, where two Sunni clerics this week called for volunteers to head to Syria and defend the oppressed in al-Qusayr and Homs. In Iraq this week, the killings of scores of Sunni protesters by forces of the Shiite-dominated Baghdad government have raised fears of a return to all-out sectarian war. The trouble began on Tuesday when the army stormed an encampment in the village of Hawija, where Sunnis had been holding protests since late December, leaving dozens dead and injured. That incident set off a wave of revenge attacks that hit five different Sunni-majority provinces, killing dozens more people and culminating with Sunni gunmen taking control of the town of Sulaiman Bek in Salahuddin province, north of Baghdad, on Wednesday. The violence is the deadliest so far linked to demonstrations that erupted some four months ago in Sunni areas of the Shiite-majority country. The Sunni protesters have called for the resignation of Shiite Prime Minister Maliki and railed against the alleged targeting of their community by the authorities. “The Sunni uprising, having now turned violent, represents a significant challenge to Maliki, whose consolidation of power over the security forces and the judiciary, and his targeting of high-level Sunni leaders for arrest, has raised alarms among world powers,” according to The New York Times. “Mr. Maliki has presided over an unwieldy power-sharing government, which nominally gives prominent roles to Sunnis but in reality has resulted in political stasis, and he has signaled in recent months that he would prefer to move to a majority government, dominated almost solely by Shiites. On Tuesday, two Sunni ministers quit to protest the raid in Hawija, and the largest bloc of Sunni lawmakers suspended participation in Parliament. “Mr. Maliki made no public comments on the situation Wednesday, but on Tuesday, after being pressed by American officials and the United Nations, he said he would open an investigation into the events in Hawija, and promised to hold military officers accountable for any mistakes. “In Iraq, the central government has aligned with the Syrian government and its greatest ally, Iran, while Sunnis here have sided with the rebels, and they now appear to be emboldened by the events in Syria to challenge their own government. John Drake, an Iraq specialist with risk consulting firm AKE Group, was quoted this week saying “the fact that this is a predominantly Shiite government and it's predominantly Shiite security forces opening fire on predominantly Sunni individuals (civilians or militants) is going to have an impact on sectarian relations and could prompt a rise in sectarian violence as a result." Lebanese political analyst Elie Chalhoub, writing for the Beirut daily al-Akhbar, which is close to the Syria-Hezbollah-Iran-Iraq alignment, says official opinion in Baghdad is divided. Political sources close to the Maliki government suspect outside forces –“including Syrian armed gangs and regional forces” -- are trying to exploit the Hawija events to help carve up a Sunni enclave in Iraq. Military sources on the other hand blame the violence on “measures taken by Iraqi army units along the border with Syria in the last 10 days. Let’s not forget Hawija, on the Iraqi side of the border, sits opposite Deir Ezzor, which is Jabhat al-Nusra’s nerve center. The reason is Tehran cannot continue seeing its regional cards come under threat as they are in Syria, Iraq, the Gulf and Yemen. “Assad’s warning that terrorism will come back to haunt the West and his latest pep talk to a visiting deputation of regime loyalists from Lebanon (see my post, “Assad on Black Sunday...”). Release of a photo showing Iran’s Supreme Leader Ali Khamenei receiving Hezbollah leader Hassan Nasrallah. The still aims to tell Lebanese Shiites that Hezbollah’s deepening involvement in Syria has the blessing of Vali e-faqih (or Guardian Jurist). Also writing for al-Hayat in the same vein -- under the title, “The counterattack… from Syria to Iraq” – is Zuhair Qusaybati. The similitude is that Tehran’s allies in Iraq and Syria “are implementing what can be described as an Iranian counterattack” in anticipation of “the grand bargain” between the United States and the Islamic Republic over the latter’s nuclear program. America suffices with watching for the time being. It is hedging its bets on Iran drowning in quagmires of religious and sectarian wars. Jordanian-Palestinian writer Yasser Zaatra, in a think piece for Aljazeera portal, speaks of Iran becoming a bane to Shiite Arabs. Initially, he says, Iran leaders described the uprising in Tunisia and Egypt as an “Islamic revival.” They changed their minds when the Arab Spring reached Syria. Zaatra says most Shiite Arabs subscribed to Tehran’s immoral stand, causing a serious sectarian split in the region – whether in places like the Gulf and Lebanon, where Shiites are in the minority, or in predominantly Shiite countries such as Iraq and Bahrain. Iran’s mobilization of Shiite Arabs against the majority Sunnis in Syria triggered an unprecedented backlash among the historically tolerant Sunnis of the Arab and Islamic worlds, according to Zaatra. Shiite Arabs – whether in Iraq, Lebanon or the Gulf -- have no interest in a confrontation with their neighbors or fellow citizens and vice-versa. Ethnic and sectarian wars leave no winners, Zaatra remarks.